LRI provides legal capacity building services to developing country delegates and civil society observers. For more information about training services, please contact us. 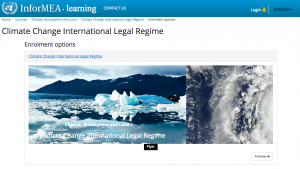 Legal capacity building has been identified by many developing countries as a key priority if they are to make a meaningful contribution to the current climate change negotiations and be able to translate commitments made under the Paris Agreement into domestic laws and policies. In response, LRI has developed training tools for negotiators and national policymakers from Least Developed Countries and other vulnerable developing countries. LRI works hand-in-hand with country stakeholders and partners to tailor training programmes that correspond to specific needs and stages in the UNFCCC negotiations process. Training programmes include teaching materials, presentations and practical exercises. Some of our training materials are available in the table below.